The SAT© subtracts a quarter of a raw point for every wrong answer-every correct answer results in one whole raw point. These wrong answer deductions are called penalty points and are designed to counteract RANDOM guessing. If you guess randomly on a selection of questions with 5 possible answers, statistical probability states that you will be correct 1/5th of the time and incorrect 4/5ths of the time. So, according to the GUESSING strategy, your guessing shouldn’t affect your score. e.g., A correct answer = 1 point for correct, and 4 incorrect answers = +1 -1[4X-1/4]=0. A wash, NO? So, if you can get a little lucky, why not guess? You may come out ahead. The problem with this approach is that it relies on probability and randomness in order to work. But no rational test taker chooses an SAT answer randomly–a test taker chooses an answer based upon ideas or feelings about the question. Therefore, the entire notion of relying on probability is flawed, because probability relies on random selection. The guessing strategy seems great in theory. If you can eliminate two incorrect answer choices and then guess randomly, you should end up gaining points. But no one does this. No one guesses randomly. A student guessing on an SAT© test is not a true random guesser, and The College Board© knows it. You’ve lost control of the question! You probably never had control of the question! So if you don't understand the question well enough to answer it, the odds are VERY good that you will cross out the correct answer right from the start. Now your chance of being correct drops to zero. Random is gone. Here’s an actual SAT© example of the fact that the odds are VERY GOOD that you will cross out the correct answer, on a harder question, right from the start. There’s a sentence completion question from a recent SAT test that talks about “bank auditors neither speaking nor smiling”. The correct answer for the blank must mean “neither speaking nor smiling”. So you quickly cross out 2 answers, one of which is “glacial”. Now you’re at 1-in-3, so you might as well guess, because the three that remain are befuddling you. Guess what you just did? You crossed out the correct answer, “glacial”. You and most other students have said: “What the heck does a glacier have to do with this sentence?” You just made a supposition, or got an impression. Suppositions and impressions throw RANDOM right out the window. You think that you’re randomly guessing on the remaining 3 answers. You’re not. You just got snookered by the SAT. Glacial: …of or pertaining to glaciers or ice sheets. …icily unsympathetic or immovable: a glacial stare; glacial indifference. Just like the bank auditors. Put yourself into the mind of the SAT test designer. The test designer’s job is to disguise the right answer, perhaps with words that you do not know, or to fool you into picking the wrong answer. The College Board© calls trap answers "distractors", intended to distract you from the correct answer. “Glacial” is one of these distractors. You need to think like the test designer, and learn how to recognize these distractors, these traps. 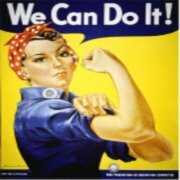 On the toughest SAT questions, less than 15% percent of students get the correct answer. The rest are guessing. Guessers get distracted by trap answers. Trap answers throw random guessing out the window. 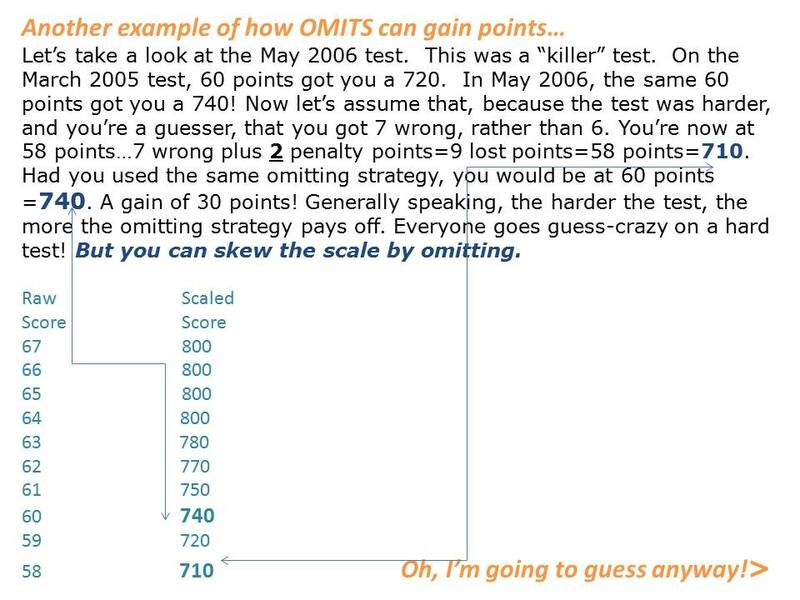 Omitting an SAT answer-not Guessing-actually gains you points! You don't get extra credit for answering a difficult question. If you can't answer a difficult question with a high degree of CERTAINTY, then don't answer the question. OMIT it. A raw score is calculated. One point is added for each multiple-choice question answered correctly. ¼ point is subtracted for each incorrect. No points are subtracted for incorrect answers to the mathematics grid-ins. No points are subtracted for omitted questions. The total of 1/4 penalty points for each wrong answer is subtracted from the points answered correctly. If the resulting score is a fraction, it is rounded to the nearest whole number—less than 1/2 is rounded down;1/2 or more is rounded up. Wait ‘til you see what this means for your score! The PIC below will show you how the scale works, and how knowledge of the scale will allow you to see the logic behind omitting. It’s possible to get some questions wrong on some forms and still get an 800. It’s possible to Omit questions on some forms and still get an 800. 800 doesn’t really mean “perfect”. Track yourself on the practice test. Note when you’ve guessed and note how often you guessed correctly. Then calculate a score, paying close attention to the number of penalty points you’ve accumulated for incorrect answers. Then rescore the test as if you had omitted. 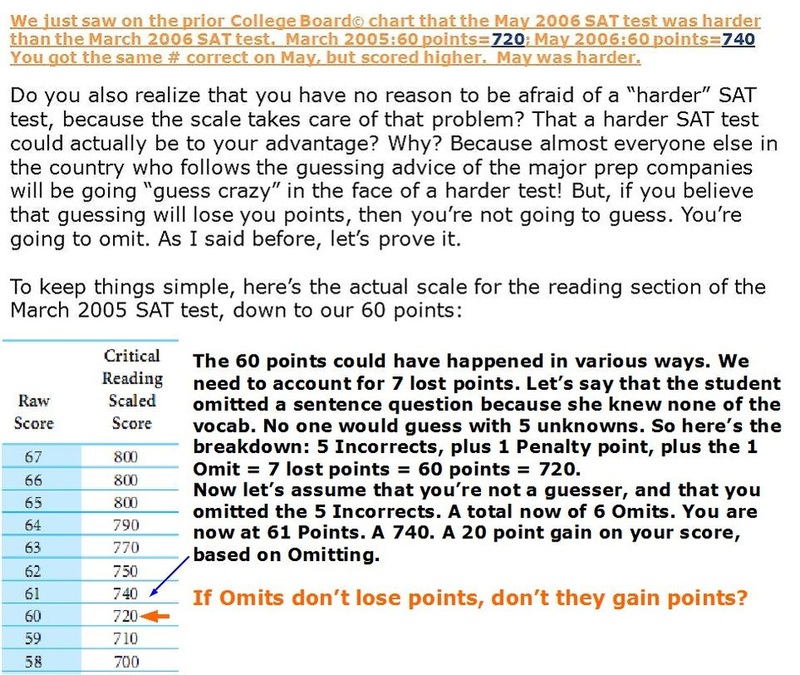 Or, if you have your actual past SAT from the College Board Q & A, play the same game. If guessing works for you, then you are a rare test taker indeed. If you’re anything like me, you’ll probably prefer to omit the question. Not a single student of mine who has scored an 800 on the SAT© test has ever answered every question. Omits can help you earn an 800. Give the omitting strategy a close look. 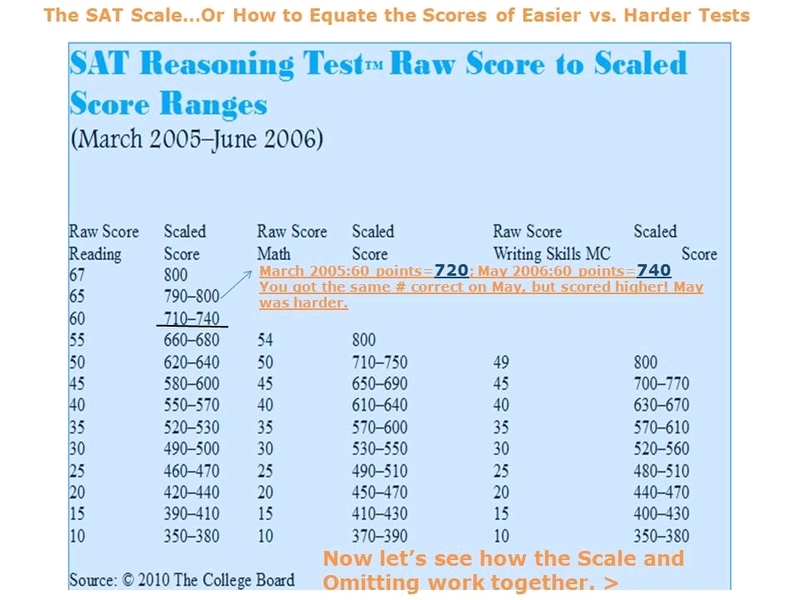 Learn how the SAT actually works.